2003 Chevrolet Corvette Coupe 50th Anniversary Pace Car 1/18th Scale by AUTOart, $199.99 at Modena Motors Inc.
Long discontinued and full of stunning details. 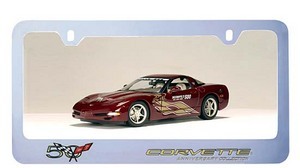 Gleaming paint quality and also included is a Chrome 50th Anniversary License Plate Bracket for your own car!!! This is the rare PACE CAR 50th anniversary Car!!!! Rare find!! !